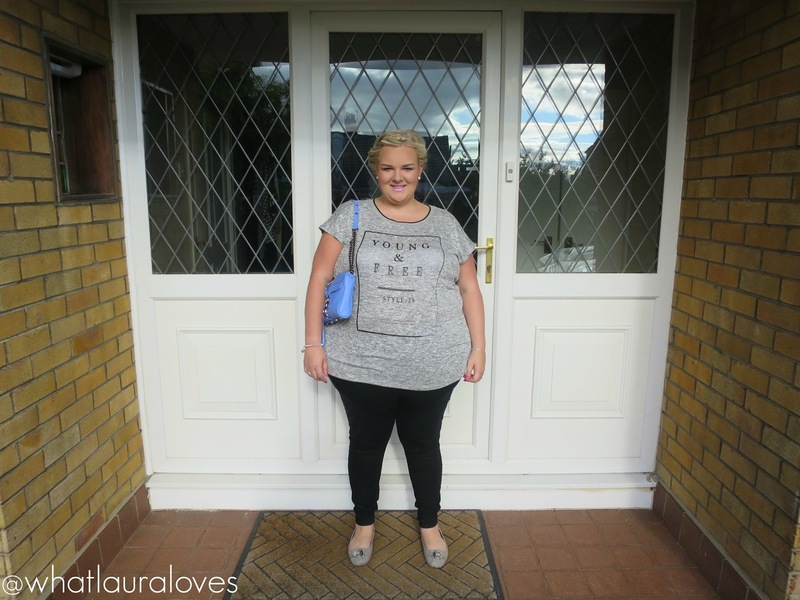 The Young and Free Slogan top was one of the pieces that I picked up at the Metro Centre store opening of Yours Clothing last week. You can read all about the day and how I met ITV’s Alison Hammond in my blog post here. Strictly speaking, this isn’t the kind of top that I would usually go for but something drew me to it and I knew that I had to have it. I absolutely love everything about it. First of all, it is a t shirt shape with short sleeves and a round neck but it is made of a fine knit material which gives it a different texture to a usual cotton t shirt. Plus, it is warmer too which makes it an ideal transition piece through to the autumn and winter. I don’t like wearing lots of long sleeved pieces, or thick items so this garment is ideal for me as the fine knit is light weight, warm and super stretchy. These are a dual sized piece. I’m usually a 22 and so I bought the 22/24 and found that it was a superb fit, very comfortable to wear and it had lots of room in it. I could have easily sized down. 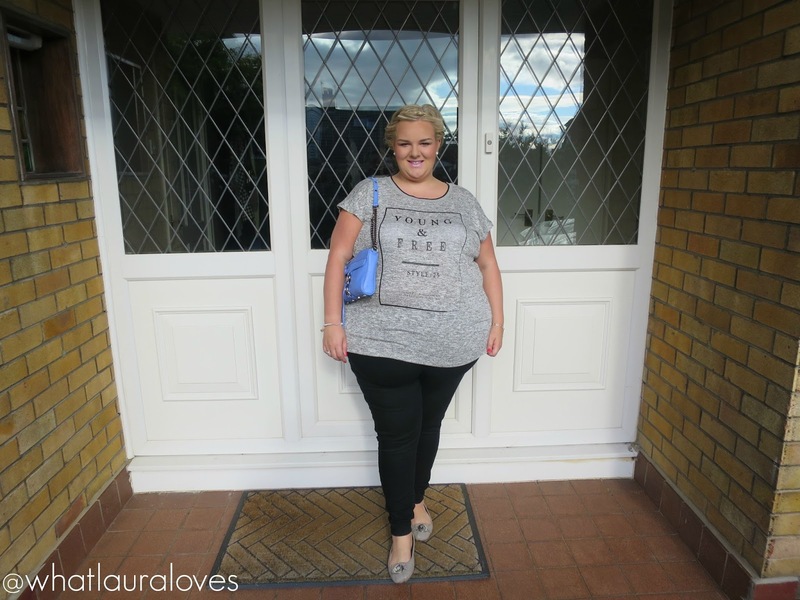 The length is great as it just covers my bottom which I think is a flattering length on tops. The grey isn’t usually a colour I would opt for but I absolutely loved the grey marl effect, especially against the black, textured print on the top. I really think that the shade of the grey marl suits me and doesn’t make me look plain and sickly like some other shades of grey have done in the past. This particular shade of grey looks fabulous with my Michael Kors flats, especially with having the plain black of my jeggings in between to break up the grey. I also think that grey looks great with silver jewellery. I added my Links of London bracelet, Guess bracelet (similar) and BHS earrings (similar) to complete this look. 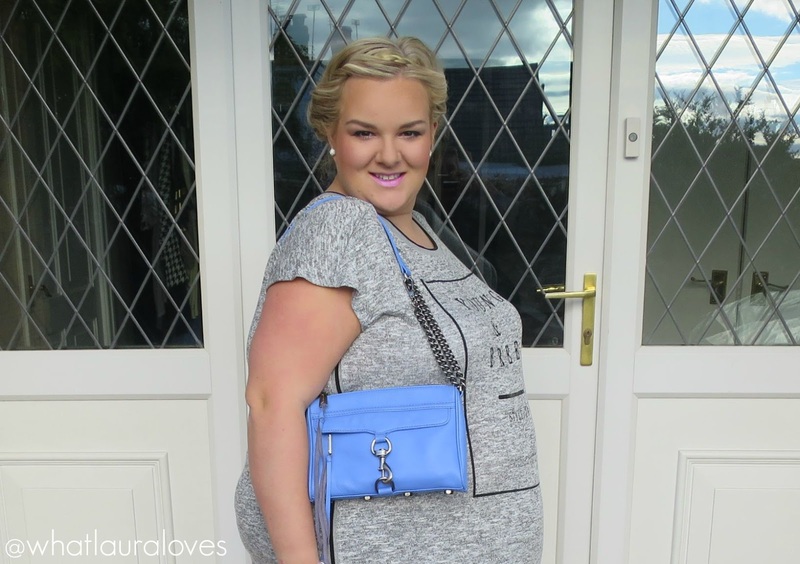 To complete the outfit, I added my Rebecca Minkoff Mini Mac Bag in Twilight (more colours and lots more styles here) which is the most beautiful shade of blue that is really hard to wear with a lot of different outfits as it hardly goes with anything! Wearing grey and black means that I can easily pair this bag with my outfit and I think it really adds a nice pop of colour. While I love this whole outfit, I think its the top that really makes it and I honestly couldn’t recommend it to you any more than I already have done. 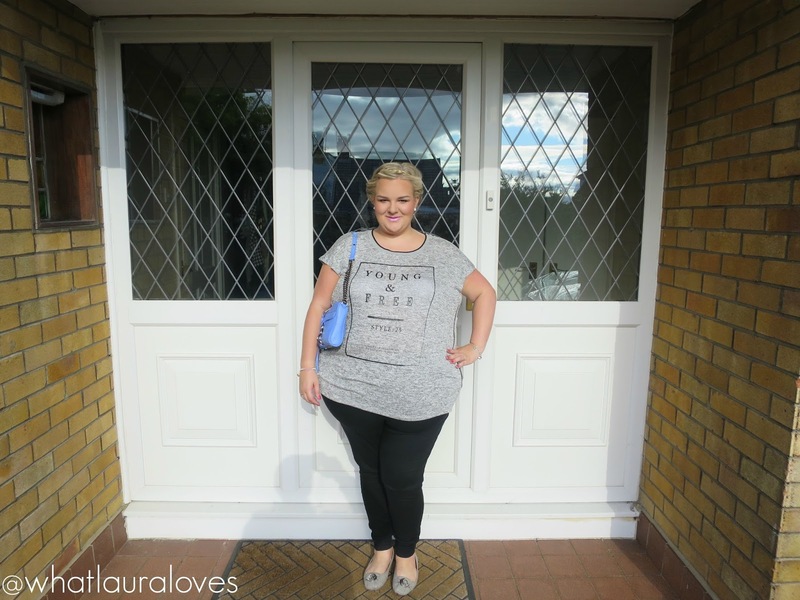 It is one of my favourite pieces that I own at the moment and if it wasn’t in the wash, I’d be wearing it right now! What are your favourite pieces from Yours Clothing at the moment? The bag looks sooooooooo good!!! Love it! And girl. you look fab! Ohhh damn, I love this outfit! The shoes are to die for too! So on point! Love the comfy/casual look, and the MK flats are fabulous! Your Outfit looks great! After reading your description of the shirt, I think I have a similar shirt and I love it too! Such a cute top! And a cute but comfy outfit in general. Love it! that top just explains my life story right now haha loving the look!